Welcome to Zoe’s profile! I have completed my PhD in 2018. Here is my dissertation entitled Perception of Lexical Tones by Homeland and Heritage Speakers of Cantonese. Currently I am a sessional lecturer at the Department of Asian Studies. 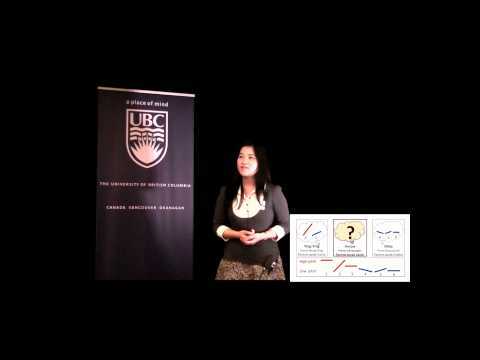 Having won First Place and People’s Choice Award in 2015 UBC 3MT, I represented UBC to compete against 19 contestants from six different continents in the global competition Universitas 21 3MT . I won Second Place, also known as the Highly Commended Award. Click here if you can’t view the video below. Note: Some online media or blogs have used materials from UBC news to generate similar posts or translated versions with inaccurate paraphrases, which do not represent my opinion. Please refer to the original article. 2017. Tone identification strategies used by heritage Cantonese speakers in Canada. Paper presented at the 29th North American Conference on Chinese Linguistics (NACCL-29), Rutgers University, New Brunswick, NJ. 2014. With Andrei Anghelescu, Joash Gambarage, and Douglas Pulleyblank. A unified account of nominal and verbal tone in Nata. Paper presented at the 45th Annual Conference on African Linguistics, Kansas University, Lawrence, KS. 2013. A complex ForceP for speaker- and addressee-oriented discourse particles in Cantonese. Poster presented at the 25th North American Conference on Chinese Linguistics, University of Michigan, Ann Arbor, MI. 2013. Approaches to Nata morphophonology. Paper presented at The 29th Northwest Linguistics Conference, University of British Columbia, Vancouver, BC. 2013. With Sonja Thoma and Martina Wiltschko. The syntax of grounding. Poster presented at Conference of the Canadian Linguistics Association, University of Victoria, Victoria, BC. 2013. With Allie Entwistle. A grammatical sketch for Nata: Verbal tone. Poster presented at The 29th Northwest Linguistics Conference, University of British Columbia, Vancouver, BC. 2007. With Cathy S. P. Wong and Robert Bauer. The integration of English loanwords in Hong Kong Cantonese. Paper presented at the 17th Annual Conference of the Southeast Asian Linguistics Society (SEALS), University of Maryland, College Park, MD. 2007. With Robert Bauer and Cathy S. P. Wong. Recent innovations in Cantonese loanword phonology. Paper presented at the 40th International Conference on Sino-Tibetan Languages and Linguistics, Heilongjiang, China. 2006. Resyllabification of the syllabic nasal in Cantonese connected speech. Paper presented at the 4th Conference of Chinese Linguistics, European Association of Chinese Linguistics, Budapest, Hungary.